Phantom power is not an exotic, supernatural, source of energy, but rather it is simply an external power supply required by the capacitor elements inside a condenser microphone. It is provided by the mic preamps located either on your mixer board or other audio interface. "Not so fast, Skippy... that sounded like you read that straight from a textbook. Why don't you try that again!" Ok, it's something that you need if you wanna use a condenser mic. The picture below shows what the switch looks like on a mixing console. Notice how the main power can be selected independently so that you are free to choose when to unleash the voltage of this beast. It provides a way to power your microphone through the XLR cable you already have connected, instead of requiring an independent power cable and supply. The spooky name comes from the fact that it is essentially invisible to microphones that do not need it... such as dynamic microphones. It could also be because it is provided down the audio paths of the XLR connector without altering the audio signal. But this sounds more like "Stealth Power" to me... which in turn sounds like a sweet 80's WWF tag team name. Whatever the reason, just know that you need it if you want to power your condenser mic. The good news is that it is a standard feature on nearly every mixer and audio interface on the market. This is good feature to check for when narrowing down your mixer / audio interface selection... not having this option will effectively eliminate the condenser mic from your arsenal. So just to recap you absolutely need this when using a condenser style microphone. It will not, however, harm a dynamic microphone if you happen to have it on. The dynamic mic simply does not need it to operate. Ribbon Mics, on the other hand, can be damaged by using Phantom Power... so always make sure you read the documentation for your mic before plugging it in. 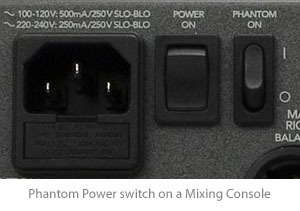 Often phantom power is supplied to all the preamp inputs at the same time, although some have controls for each input or bank of inputs. 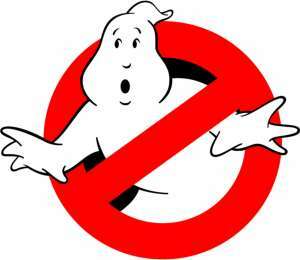 So leave your superstitions behind, because these phantoms are specters of electrical science, not the "other side". See?!? There's nothing to be scared of!! !